London is full of great restaurants, so to stand out and survive in this cut throat world you need something different, and Kojawan does that in spades. It is a lovely breath of fresh air just near to Edgware Road tube station, and not only is its differentiator the fusion of Korean, Japanese and Taiwanese food (yes its letters from each that gives the restaurant its name), but the other is its use of manga sci-fi décor and amazing views looking out over London. Kojawan is a marvelous mix of exceptions that probably shouldn’t work if you looked at them on paper, but chefs Omar Romero (formerly of Rhodes Twenty Four) and Bjorn van der Horst (The Greenhouse) have managed to take a number of eclectic ideas and styles and have married them together into a memorable experience which you really need to experience at least once. Your first anomaly hits you when you leave the tube and after 100 yards enter the ultra-corporate lobby of the Hilton Metropole. This is just about the furthest environment away from where you would expect a quirky Asian Fusion restaurant, but just as you think you are in the wrong place you spot a set of footprints leading across the foyer to a set of lifts that will take you to the 23rd floor where Kojawan awaits. As you leave the lifts a spiral staircase stretches away from you leading up to Kojawan, a seductively cool 21st century izakaya, (a Japanese gastropub) which as it’s on the 23rd floor has an amazing view of London stretching out as far as you can see. With each step you take up the stairs you are one step closer to a unique experience where hi-tech futuristic décor reigns. Modish furnishings, manga graphics, wall tv’s showing bespoke manga videos and multiple artwork gives a seductive futuristic look which is unique, as far as I know, in London. Once seated the next anomaly hits you in the form of the menu. I am fairly accustomed to reading menus, but this one was not an ordinary one (I was beginning to see a trend here about being different!) as the order of things and dishes are mixed up. Having had some translation of the menu from the extremely helpful staff we started with the Booze Food section, picking the Sesame Crackers with a pork mince dip (£4) and Spicy Crab Dumplings, chilli and ginger dip (£9). The crackers were crisp and were accompanied by a lovely rich meaty sauce, and the light tangy crab was encased in a light batter, a perfect start to the meal. Looking again through the maze that is the menu, we came across the To Start or To Share section, and selected a Prawn Cocktail, Avocado, Seaweed and Toasted Brioche (£13), and the Stone Bass Poke, Shiso, Jalapeno and Sake (£13) which came with sticky rice. I love restaurants that stimulate all of your senses, and Kojawan does just that, with the meaty prawns sitting on a bed of cool and fresh avocado and textured seaweed in a V shaped bowl standing proudly on ice. After this we turned our attention to the Charcoal Oven section and plumped for a generous offering of Charred Octopus bathing in a smoky red pepper oil (£14), which was taken to a new level with a dash of lemon. Our other selection was the Sticky Pork Belly with Jalapeno Ponzu (£15) which matched the sweet soft melting pork with a zing from the Jalapenos. Portions are generous so it was with increasing trepidation that we were presented with our main courses which for me was Fat Noodles (£15), which was an Asian twist on Spaghetti Vongole, with an abundance of clams and parmesan and Bonito dry fish flakes that appear to dance under the influence of the heat from the dish (worth choosing just to see what I am describing as it was incredible and had my wife fascinated!). My wife chose the Pork-Green Onion “Egg Cake” with Parmesan Cream and Iberico Ham Flakes (£15) which was a lovely example of a Japanese savory pancake. Dessert or the Sweet Spot in Kojawan speak, were truly marvellous, and finished off a memorable evening, and I am sure that other choices are good, but the PanTako (£9) and Slushy Bubble Tea (£7), are a must. The Pantako is a fluffy light pancake crammed with White Chocolate and Berries and the sharpness of the fruit competed bravely with the smooth creaminess of the chocolate, whilst the Slushy Bubble Tea was a slushy with a difference. The difference was rather than artificial colourings providing the taste here, strawberries swam in the freshest crispest mango flavoured ice you could wish for. London is a wonderful mix of races, religions and identities, and for the first time I have visited a restaurant which mirrors this diverse and vibrant city, by marrying styles and tastes effortlessly, and all with a truly breathtaking view. What more could you ask for? When you ask people to name a famous chef or a famous restaurant, one on the tip of everyone’s tongue would be Raymond Blanc and his 2 Michelin Starred restaurant Le Manoir aux Quat’ Saisons. Raymond is unique in that he is an entirely self taught chef, but he has taught or employed some of the best, including Heston Blumenthal and Marco Pierre White, and he has created many fabulous tastes and food combinations. The first of the Brasserie Blancs was opened in Oxford in 1996 and was initially named Le Petit Blanc, but in 2003 this, and the other three in the growing chain, became part of the Loch Fyne Restaurant group, but Raymond still maintains a share in the business and continues to be involved in creating new menus and developing the chef and kitchen teams. This enables the French philosophy of “good food being central to good living” to be maintained, and to keep providing food that can be enjoyed by everyone – “from the time-conscious business person to those looking for a welcoming family restaurant”. The chain has gone from strength to strength and is now in a number of locations, but that attention to detail and pride in the food that Raymond initiated remains in every location. My wife and I visited one of the newer restaurant’s situated a mere stone’s throw from Waterloo Station, the London Eye, the Royal Festival Hall and all of the cultural attractions of the Southbank. The restaurant boasts a lovely little terrace at the front which caters equally well for patrons who want to enjoy a few drinks prior to dining, or for those workers who fancy a few drinks to unwind after a hard day at the office before making their way home from Waterloo. Once you have enjoyed your drink you descend into the restaurant which has a lovely buzz of people enjoying themselves in a relaxed but professional atmosphere. Although underground, the décor and lighting gives the feeling that there is more space than there actually is, and a warmth that helps you to feel as if you were in a Parisian brasserie. The menu is simple but caters for every taste, and follows the simple mantra that customers will return again and again if the food is flavoursome, caters for everyone in your party, and is keenly priced. The entreès are split between the classiques which remain on the menu regardless of the time of year, and the seasonal offerings. My wife chose one of her favourite dishes, the cheese Souflèe (£7.50) with a mature cheddar sauce, and was rewarded with a warm smooth gooey cheesy centre once she broke through the crispy outer layer, and I was torn between the Mediterranean Fish Soup (£7.90), and the Potted Cromer Crab (£9.50), but was pleased I chose the Crab, as the clean crab was perfectly supported by the fresh avocado, shallot and coriander guacamole and some toasted pain de campagne. The selection for the main course, or Plats as we are at a brasserie, is extensive, and for me that is a problem, because as you know, I have difficulty in deciding (! ), but for parties it is perfect as there is something for everyone. As with most Brasseries there is the mandatory Steak Frites (£19.90) with a 9oz Cornish Rump Steak, French fries and ‘Café de Paris’ herb and mustard butter, but as it was a typical English spring day (i.e. cold!) I plumped for a Boeuf Bourguignon (£18.50) and my wife a Boeuf Stroganoff (£14.50). The Bourguignon was hale and hearty and almost rustic, with meaty and tender beef sitting proudly on light and creamy mash, all topped with a rich red wine sauce and large lardons and baby onions, an absolute delight on a cold day. The stroganoff also boasted tender beef but here it was bathing in a slightly tangy creamy sauce, all on top of fluffy rice and again a real treat. After a short break just to allow our first two courses to go down, and to enjoy a few sips of our lovely South African Chenin Blanc (£19.95), we turned our attention to the desserts. The Baked Alaska flambèed with Cointreau (£13 for 2 people) tempted us, but my wife remembered the lovely souflèe starter and opted for the Pistachio Souflèe (£7.50) which was equally as good as the first, and I went for the Chocolate & Almond Torte (with Vanilla ice cream and crème Anglaise (£6.50). This had everything I love in a chocolate dessert, as the melting rich molton chocolate taste burst onto my tongue, and was offset by the creamy vanilla ice cream and the light Crème Anglaise. 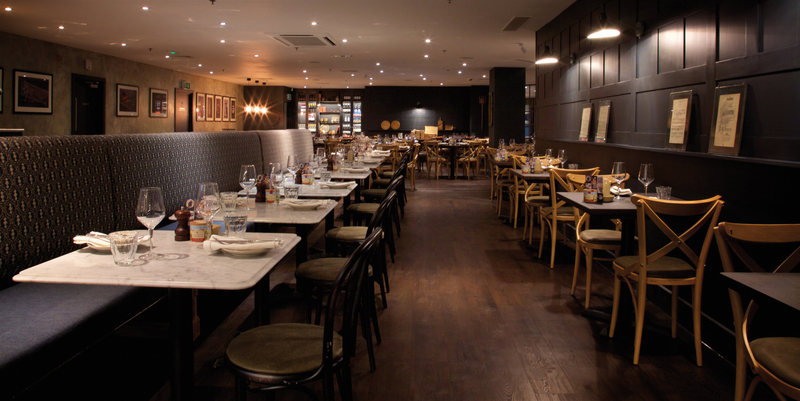 Because of its location, Brasserie Blanc has many pre-theatre offerings, but this is more than just a stop off before the theatre. It is a welcoming family restaurant which will appeal to all ages and tastes. The Kings Cross area over the last few years has undergone a significant overhaul with considerable development around the two stations, and with the arrival of the Eurostar has turned the run down areas into up-to-date trendy developments. These new developments sit side by side by some of London’s more closely guarded secrets, one of these being the Regents Canal, which snakes its way across London providing a peaceful haven often hidden by the surrounding buildings. 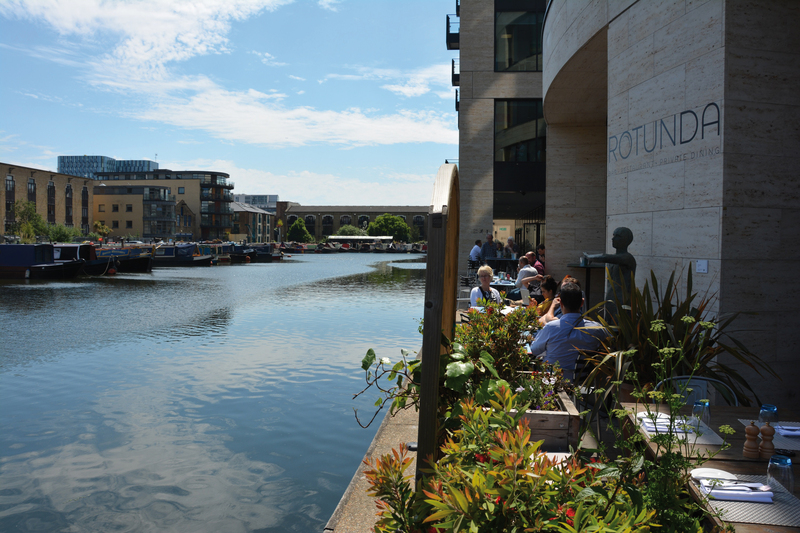 Today it is well-loved by boaters, walkers and cyclists all looking to escape the capital’s busy streets, and it provides a number of marvellous locations for restaurants and bars, and Rotunda has picked one of the best. Nestling below an ultra-modern art gallery and office block, Rotunda overlooks the tranquil canal and one of a number of canal basins full of colourful narrow boats, and has a bustling bar, private rooms and a circular dining room, as well as a lovely outside area for when the sun shines. The décor in the restaurant is smart and functional and the tables are arranged so the maximum number of people get the view out onto the canal, but when the weather permits it is best to relax on the waterside terrace. This terrace spans the entire length of Rotunda on the edge of the Regent’s Canal, and this summer you can visit ‘The Waterside Garden’. Here Rotunda has partnered with Champagne house Perrier-Jouët, local charity Global Generation, and sculpture gallery Pangolin London, to create a beautiful garden on their canal side terrace. Here you can grab a deck chair and with a glass of Perrier-Jouët Champagne in hand, it’s the perfect spot to enjoy the summer and watch the comings and goings on the canal. Rotunda has a wide range of starters and you can even enjoy a tapas combination of 5 dishes from the bites and nibbles selection (£21.95) if you feel hungry, but my eye was caught by a Chilled Pea Soup with Mint Crème Fraiche (£6.50) and my wife’s by the Pan Fried Scallops, wilted spinach, Champagne veloute and aruga caviar (£12.50). My soup was fresh and crisp with just enough mint to add to the flavour rather than overpower the fresh pea. The meaty scallops were cooked perfectly and were smothered with a rich and creamy champagne veloutè and a generous portion of caviar. What sets Rotunda apart from many is that it has its own farm in Northumberland where all of the beef and lamb that they sell comes from. The animals are hand reared and hung for 32 days onsite, and butchered by their own butcher. Because the meat is hand reared and hung for so long, the meat is tender and less bloody, and they hold special events to taste the produce. Tempted by this my wife chose a medium rare Pan Seared Flat Iron Steak (£17.50) which was cut into lovely pinky strips and accompanied with a marinated Isle of Wight heritage tomato and watercress salad. I however, was tempted by the Pan Fried Scottish Salmon in Champagne cream sauce and seashore vegetables (£17.95) and was rewarded by moist salmon encased in a crisp skin all bathed in a rich creamy sauce, perfect in every way. To accompany our mains we opted for the truffle macaroni cheese for two (£6.95), and frankly I wished it was just for one, as the creamy cheddar and parmesan cheese sauce infused with just enough truffle oil, was truly special. Desserts are extensive and challenged us as we just couldn’t decide, but eventually we agreed to share the Chocolate and Banana Cake, Caramel, Pecans and Popcorn (£6.50) and the Tart of the Day, which was Banoffee, with Cornish clotted cream (£5.95). The tastes and mix of textures were varied and rounded off a good meal. The wine list here will cater for all tastes, and satisfies those looking for an accompaniment to their meal or those having a drink after work, and start from £19.50, which is almost as refreshing as the wine itself! Rotunda is the perfect place to relax after a busy day, and whether you just want a refined drink or a meal, Rotunda caters for you perfectly, and I can’t wait for the better weather to use the terrace and enjoy again this little oasis right in the heart of London. When I was a few years younger I spent quite a lot of time in Bournemouth for work, and so it was quite nostalgic for me when we entered the Triangle in the centre of Bournemouth having left London only a couple of hours beforehand. Bournemouth is so underated, as it is a vibrant and cosmopolitan town, boasting 7 miles of golden sand sandwiched between the dramatic Jurassic Dorset coast and the tranquillity of the New Forest, but when I was there years ago what it lacked to entertain its cosmopolitan residents was a quality restaurant or two, but that might have changed with the advent of the new Hilton Hotel and its partnership with Matt Tebbutt in creating Schpoons and Forx. I am usually not a fan of a restaurant whose name advises me of what utensils to use whilst eating!, but in this case I will make an exception, as this is better than its name, but before picking up your “schpoon and forx” you really need to visit another of the new Hilton’s offerings, their stunning sky bar Level8ight, located on the top floor. Level8ight is a sky bar with wall to wall stunning views of Bournemouth on one side, and on the other side the bay, and sandwiched between them is a centrepiece bar, chandelier style lighting and an eclectic mix of velvet and leather chairs. This, I suspect from the queues for the lift to take you up there, is the place to go in Bournemouth at the moment, and I can see why. The feel is of a smart London hotel (until you look out of the window) and as we were there on a Saturday night the place was packed and had the marvellous buzz that a place full of happy people has. Despite this, the service was swift and the waitress/waiter were helpful in suggesting drinks from the extensive cocktail menu, like a Samphire and Sea Lavender Martini (£8.95), blending the slightly salty samphire infused gin with the smooth egg whites or a Pine a Colada (£8.95) taking Koko Kanu, Havana Club 3 años, Coco Lopez, lime juice & pineapple juice and topping them off with a pine liqueur and sea air foam. What could be better than watching the sun set over Bournemouth bay whilst sipping your chosen tipple? If you love Tapas then you can stay with the view, but I fancied something more substantial, so it was a trip back down in the lift to Schpoons & Forx (S&F). 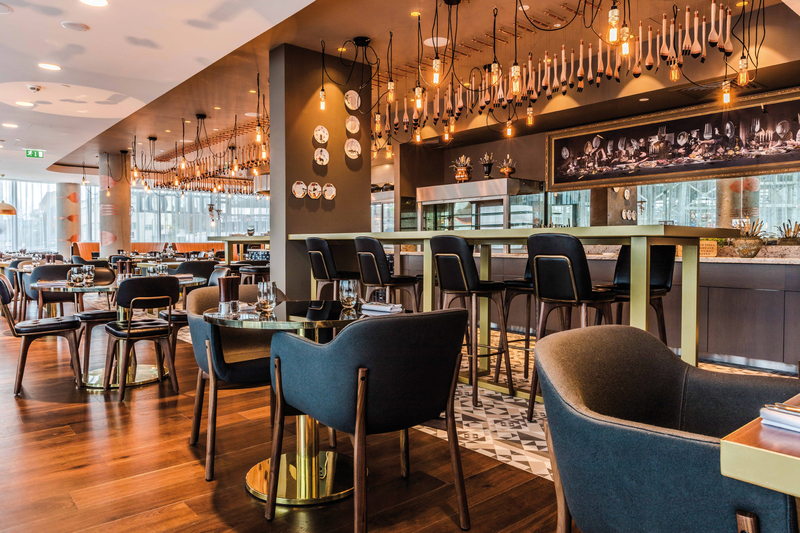 A mixture of tables, high benches and booths encircle a large open plan kitchen which allows the diner to not only taste the food but see how it is prepared, which is refreshing and shows you the care the chefs take in making your experience special. To start our meal we selected Bagna Cauda and Smoked Aubergine Puree and crackers (both £4) from the pre-starter section. The stand out dish for me was the Bagna Cauda, a speciality of Piedmont in Italy, which allowed us to scoop up the rich and warm dip perfectly flavoured with garlic and anchovies with a wide variety of fresh crunchy vegetables - a real treat to the taste buds, and unfortunately not a common offering at restaurants. When menus are extensive I always find difficulty making a decision, as I choose something, and then as I read on I change my mind again and again as I see different dishes, and the same happened here with the starters. After a period of discussion with my wife we selected the Slow Cooked Pigs Cheeks in parsley, garlic, melted onions and green chilli (£9.50), and the Beer Battered Monkfish “Scampi”, smoked paprika and aioli (£8.90). My pigs cheeks were served in a small roasting dish nestling on a bed of soft polenta and were ‘melt in the mouth’ delicious, whereas the Monkfish Scampi combined the slightly sweet taste and dense texture of the Monkfish with a light batter perfectly. The difficulties in choosing continued into the mains where there was a dazzling choice of fish and meat dishes, many using the kitchen’s tandoor oven. My wife chose the Smoked Haddock Risotto, mascarpone and soft herbs (£16.90 for a main portion and £9.50 for a starter size), and I chose the 400g Tandoor Roasted Rib Steak with watercress and duck fat scraps (£33), as I wanted to see whether a steak cooked this way lost its flavour, and if it could be served medium rare as I love having it. The chunks of flaky haddock nestled contentedly in the rich and creamy rice and the beef answered all of my questions/concerns around cooking it in a Tandoor, as the intense heat had left the outside crispy whilst leaving the inside moist and slightly pink as it should be. Additional choices on the menu include duck with a puy lentils salad (£19.60) chicken breast with sated wild mushrooms (£15.50) and Cornish Hake with asparagus and wild garlic (£18), so as a person who can’t make a choice it was very difficult to choose! After a break to allow us to savour our lovely Casa Albali Verdejo Sauvignon Blanc at a very reasonable £19 a bottle, we were able to turn our attention back to the desserts, and the third difficult decision of the meal. Desserts are all £7.50, and after flirting with a locally made “Chococo” Chocolate and “Liberty Fields” Apple Aperitif or a Banana Tart, we plumped for the Dorset Apple Cake, clotted cream ice cream, and the Fresh Pineapple, Passionfruit and Lime Pavlova with vanilla mascarpone. The Dorset Apple Cake was rich and packed with apple, well-seasoned with cinnamon, offset by the light ice cream. The pavlova was equally light, and the slivers of pineapple and passion fruit refreshing, and a perfect ending to the meal. Bournemouth is so underrated as a place to visit, and not only has a fabulous beach and attractions, it also now has a great hotel, skybar and restaurant to visit. My advice is to look past the name and instead focus on the fact that this restaurant serves good food in a relaxed and welcoming environment, and is well worth a visit.